You are lifted up in heart, though and prayers. May God comfort, hold you close and give you His peace that surpasses all understanding to keep your hearts and minds through Christ Jesus now and always. Thank you for your service. On behalf of Moms Back the Blue of the St. Louis County Police Family Association, we offer our heartfelt condolences to the family (blood and blue) and friends of Officer Tuder. R.I.P. Brother. My thoughts and prayers to your family as well as your family in blue at the Mobile Police Department. Rest in peace Officer Tuder. Young and forever a brave hero. Mobile, Alabama citizens will be deeply grateful for your honor. Thank you for your service. Prayers being sent up for your families, at home and at work. You will not be forgotten!! Rest in peace my brother. Our thoughts and prayers are with you, your family and the Mobile Police Department. Rest in Peace Officer Tuder. Thank you for your service to your community. We'll hold the line. Thank you Sergeant Chad Miner for that beautiful poem just above here! Officer Tuder, again I find myself here reading how your young life was taken at the hands of a criminal. Senseless. I can see on your face that you loved your job and you were proud to be a Police Officer! Thank you for the service and the sacrifice that both you and your family gave to your community to make it better. You, Sir are a true brave Hero and will not be forgotten. Rest in Peace now as those you love grieve your loss. Rest in peace Officer Tuder! May you Rest In Peace. Thank you for your service. Officer Tuder is a True Hero. May Our Lord Have Special Place in His Heavenly Home for Officer Tuder. 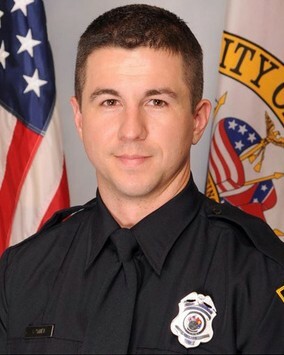 My sympathies go out to the Tuder family and the Mobile, Alabama Police Department. To my brothers and Sisters in Blue stay safe and go home to your families. RIP OFFICER TUDER, praying for the family, fellow Officers and their families and friends of this young man. This is absolutely heartbreaking. Another one of our city's heroes taken way too soon... My thoughts and prayers go out to the family and friends of Officer Tudor. Thank you for your service! May you rest in peace. My heart is broken for your family and friends. RIP Hero. Your life mattered. This is happening way too often today. Rest In Peace Hero. Rest easy brother, we have the watch. God speed Officer Tuder. May God comfort your immediate family and fellow officers. Thank you for your service and sacrifice.